ClearDB is phasing out the Mercury DB and Titan DB service plans for the Microsoft Azure cloud; please upgrade these plans prior to March 14, 2018 to avoid a service interruption. Due to recent changes in the Azure cloud, ClearDB will be phasing out the Mercury DB and Titan DB service plans from both the Azure Marketplace and the ClearDB website, beginning December 05, 2017. All other service plans are not impacted. Upgrading to a Venus DB, Saturn DB or Jupiter DB subscription is instant, boosts your database resources, provides access to 24/7/365 support through the ClearDB portal, and results in zero downtime or disruption for your application. Customers who are not able to upgrade from the Azure portal can instead use our Azure Upgrade Wizard to complete this process, which is detailed below. 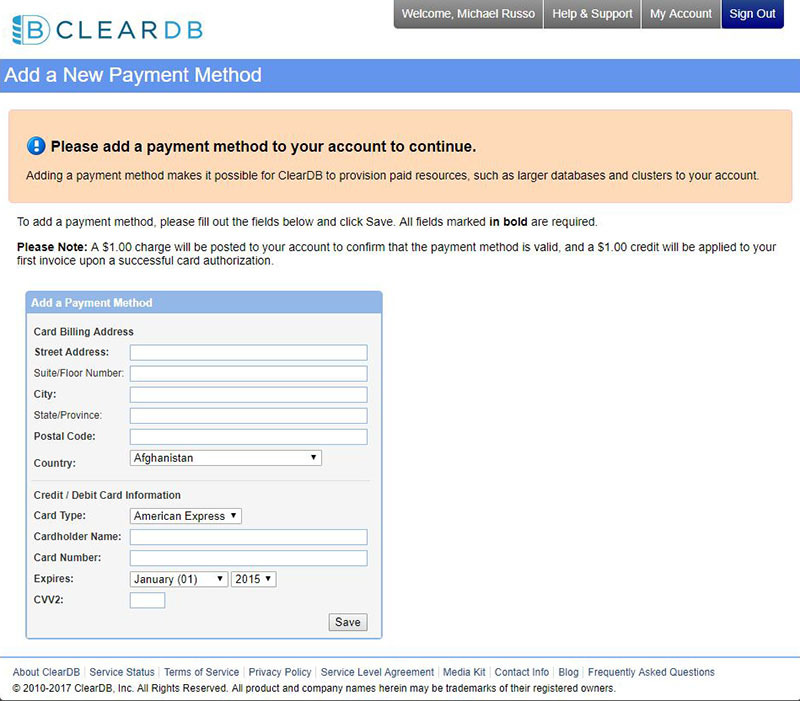 If you already have a ClearDB account with direct login access enabled and have also already placed a payment method on file, then just skip to STEP 2 below. 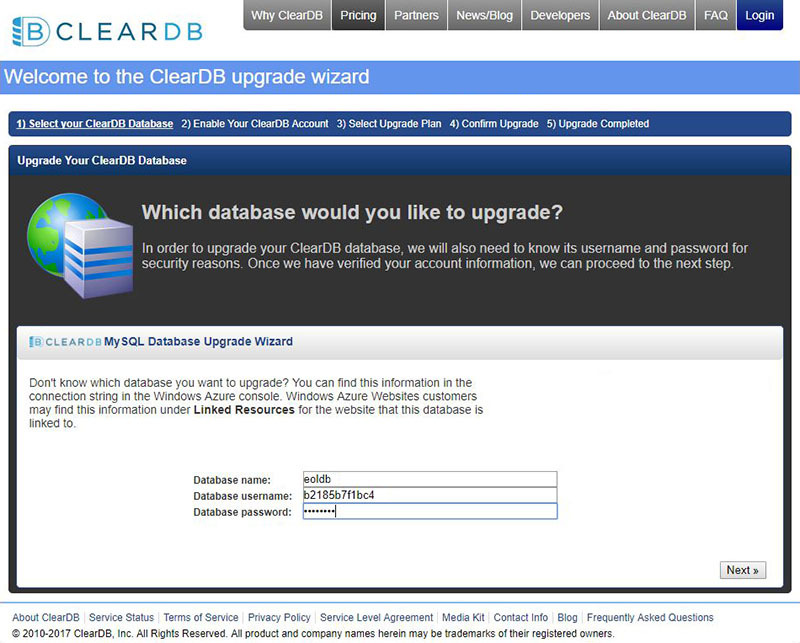 If you entered everything correctly then you will be logged you into your ClearDB account, however you will be diverted to a page where you can add your preferred method of payment for the upgrade. Complete this information and then click the “Save” button. 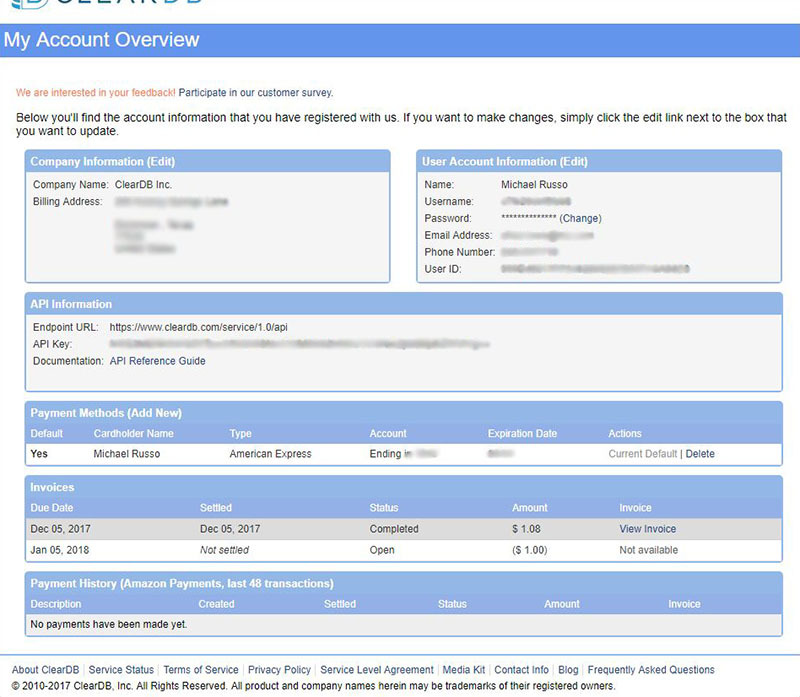 You’ll then be shown a page detailing your account information, and this is your chance to edit anything that looks incorrect or out of date. Now’s a good time to double-check your email address so you don’t miss any important alerts about your database, and you also might want to write down your ClearDB username at this time in case you need it later to log back into the ClearDB portal. Now that you’re logged in and have a valid payment method on file and your account information is up to date, you’ll need to head back to the start of the Azure Upgrade Wizard and follow STEP 2 outlined below. 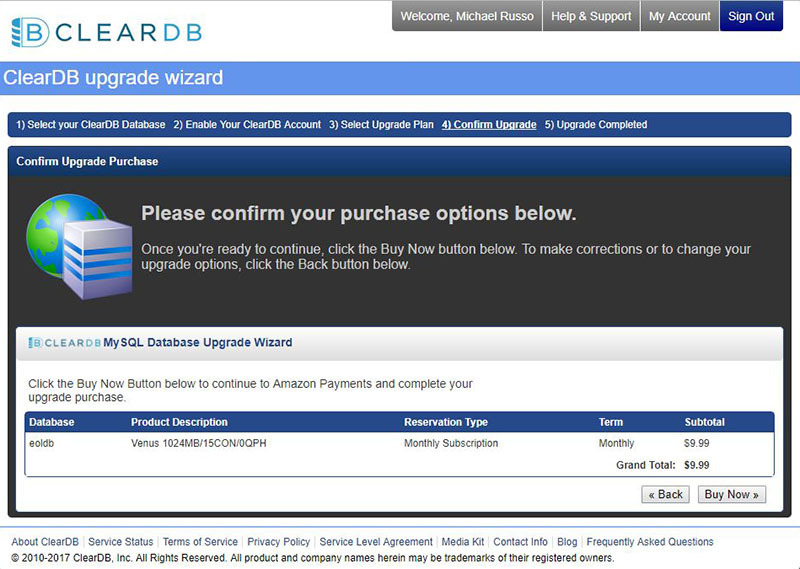 Start the upgrade process by visiting the Azure Upgrade Wizard and entering the details for the database you would like to upgrade. You will need to know the database name, database username and database password. Note the username and password you enter here should be for the MySQL database you want to upgrade, not for your ClearDB account. This information is identical to what your application uses to connect to your database. Click the “Next” button to continue. The next step is to choose a new plan level from the list presented to you, then click “Next” again to lock in your choice. You will be taken to a new screen to finalize your order. If you agree with what you see then just click the “Buy Now” button to finalize your order. Your database will be instantly upgraded to the new subscription level, granting you instant access to the benefits of the new service plan. Congrats! Please note that customers with a large number of managed databases on the Mercury DB or Titan DB subscription plans might prefer moving them to a dedicated datastore instead of upgrading each plan individually. You can add up to 100 databases on any dedicated Developer or Production tier datastore for a flat monthly rate, so it’s possible to save money with a dedicated datastore while boosting performance and gaining additional features and benefits. Please contact sales for more information about our Developer Tier or Production Tier dedicated datastores for the Microsoft Azure cloud. 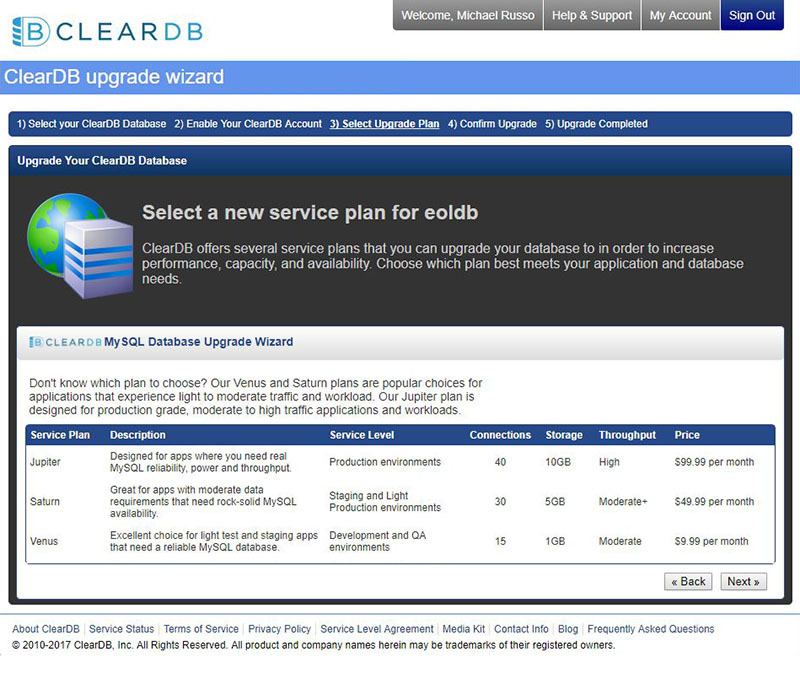 If you do not wish to upgrade your Mercury DB or Titan DB subscription, please make sure to download a backup of your database using either the ClearDB console or a third party tool like MySQL Workbench. You can then migrate it to an alternative solution prior to the change of service deadline of March 14, 2018.